The Invicta Dynamos fell to a 5-1 defeat at the Hive on Saturday night despite having kept themselves within one goal until early on in the final period with captain Anthony Leone scoring the away side’s goal. The Dynamos were without the services of Arran Strawson, Ryan Giles and Callum Best leaving them with only 12 skaters. With netminder Adam Long leaving the club during the week Conor Morris was the only goalie on the game sheet for the Kent side. 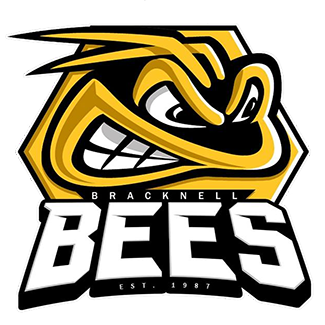 Morris was kept busy during the first period and was called into action within 40 seconds – doing well to smother the play before an onrush of Bees players took advantage of the puck being placed in a good position in front of the Invicta net. Brendan Baird was next to test the Mos netminder and once his shot went through a cluster of players Morris did well to tip the puck into the air and eventually knock it away from any danger. A further save by Morris on 04:23 kept out Roman Malinik but the Bees import was soon turning provider for the home side’s opening goal – scored on 05:52 through Aidan Doughty after Malinik found Zak Milton in space and his effort was tipped by Doughty for 1-0. On 07:30 Ryan Watt should have doubled the lead when he was left at point-blank range in front of Morris but the Dynamos netminder calmly killed the play. The first powerplay of the game then fell the way of the hosts on 09:51 when Andy Munroe slashed at an opponent but the Mos stood firm for two minutes and were successful in returning to full strength without conceding. Another Bees powerplay in the 14th minute was effectively executed after Jake Stedman had been adjudged to have hooked a Bees’ attacker. The hosts then went on to rattle the goal frame before eventually doubling their goal tally to 2-0 on 18:39 through Stuart Mogg with the Dynamos down a man as Matt Foord sat for hooking. The second period was a much tighter affair – it brought no goals but the Dynamos did have Conor Morris to thank on a few occasions. However, it was the visitors who put the first significant attempt on net during the frame – Ondrej Zosiak with a driven shot at the target through a cluster of bodies before seeing the puck deflected wide. The Bees then had a strike disallowed on 24:54 after one of their forwards kicked the puck into the back of the net. Matt Foord went on to have two shots at Bees netminder Danny Milton – both comfortably denied. Morris was then in the thick of the action again, denying James Galazzi on 27:33 and Ryan Watt with 29:07 on the clock. Just as the game’s halfway point was reached David Millner rattled the Dynamos’ post before Louis Colvin then registered another Mos effort at the opposite end of the ice pad. The visitors were placed on the penalty kill soon after with Harrison Lillis guilty of hooking and, despite heavy pressure in the Mos’ zone, the Bees were unable to capitalise with the score remaining 2-0 at the end of the period. The final period produced goals and the Dynamos were on the scoresheet at 42:36 – Ryan Morgan playing the puck to Matt Foord out of defence with the experienced Foord, still remarkably playing with a broken foot, manging to find Anthony Leone surging forward and the Mos’ captain making no mistake dispatching the puck past Milton for 2-1. A long delay then took place due to a technical problem with the scoreboard but, shortly after the restart, the Bees edged two goals in front once more with Roman Malinik making the most of an Andy Munroe mistake for it 3-1 at 44:50. The Dynamos had a couple of powerplays with Zack Milton (holding on 46:57) and Scott Spearing (hooking on 49:58) both providing opportunities for the away side to make the most of their extra man but, despite getting a few shots on goal, the Mos couldn’t get one back. The Bees then went up a gear and scored through Billy Paynter on 52:31 and Roman Malinik on 53:57 to finish the night 5-1 victors.